DES MOINES, IA - Head Coach and Director of Football Operations Mike Hohensee announced today that the Iowa Barnstormers have been assigned rookies Roger Jackson and Devon Dace for the 2014 season. Jackson (6-3, 185, Arkansas Tech) joins the Barnstormers for his rookie season after playing collegiate football for Arkansas Tech University. A freshman red-shirt, the wide receiver tallied 92 catches for 1,249 yards in 27 career games. Excelling his growth over the 2-year tenure, Jackson was recognized as one of the team's top receivers his junior and senior seasons (2010-2011). Dace (5-11, 190, Missouri Southern State) played 11 games for the Lions while collecting a total of 24 tackles, a 2.2 TKL/G average. Prior to his single-season tenure in Missouri, Dace was a three-year starter for the University of Rhode island Rams where he collected a total of 15 tackles in 19 games. 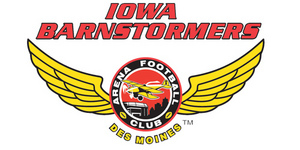 The Iowa Barnstormers home opener is scheduled for April 12, 2014 against the San Antonio Talons. Season tickets are already on sale for as little as $110 per seat. Don't miss a minute of the action this season! To order your seats or for more information, please call the Barnstormers at (515) 633-2255 or log onto www.theiowabarnstormers.com.